The duplex apartment is located in Port Grimaud III in the tower of the residence "Les Grimaldines 1" in the rue de l'Amarrage and extends to the 2nd and 3rd floor.This includes direct private parking in front of the entrance of the building. The entrance to this private area is through a large gate to which only persons have access, authorized by code entry, and this is also necessary for the entry of the vehicle. On the 1st floor of Alamic there is a spacious bedroom with a double bed and a completely renovated bathroom with toilet. There is also a separate corner with a bunk bed for children in the entrance area of the apartment. At this level, there are also plenty of fitted wardrobes. In the upper floor are a cozy living room with a living area and a sofa that can easily be converted to another sleeping place (queen bed / two people). There is also a fully equipped kitchen with dishwasher, espresso machine, and a folding dining table. In addition, you have access to the large, sun-drenched terrace. There are garden furniture and an electric awning available. In summer, as there are good insulation and very good ventilation without draft. There are enough bedspreads available for 4-5 people and you can select, depending on the season. The bed linen has to be brought, but it is also possible to rent them on the spot with our hosting service for the length of stay (on request, as well as towels and bath towels). We will gladly organize for you when needed. On the living floor, you can find a portable color television, with the local cable program (English programs are available) now in HD quality. Another connection socket is also available in the bedroom. Since the 2014 season, Port Grimaud III is teamed with WIFI / WLAN and is free for our guests. Electric heaters are available in all rooms, it should be a little colder when you are planning for a holiday in the south of France out of the warm season. Our apartment will be looked after locally by an English couple who will be your personal contact in Port Grimaud, if you have any questions or requests. They also organize a laundry service, which can be booked on request (including towels for the beach). For further questions about your holiday in southern France, we are at your disposal. If you wish, we can arrange a shuttle service to the airport, we recommend the cheapest rental car. The use of the water taxi “Côche d'Eau” to the two beaches of Port Grimaud is free of charge for our guests (from mid-June to mid-September). 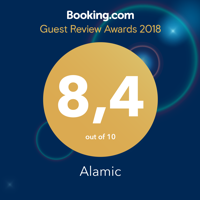 It is very important to us that you feel very comfortable in L'Alamic and Port Grimaud. That is why we have had many regular customers since 2005, who regularly go on holiday here.